Today is the day! 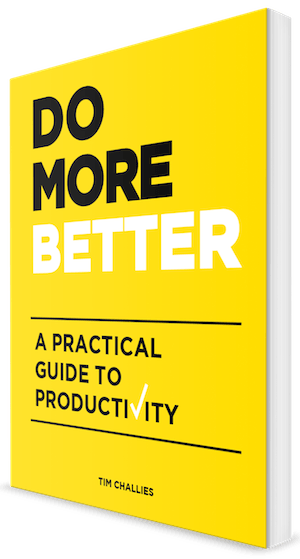 My new book Do More Better: A Practical Guide to Productivity is now available. This is a unique book on productivity and one that I believe will prove helpful to anyone who reads it. In fact, the book begins with these words: “I believe this book can improve your life.” And, let’s be honest, it would not have been worth my time writing it (or your time reading it) if I didn’t believe that. I believe it can and will. I can say this because of the nature of productivity. I define productivity as effectively stewarding your gifts, talents, time, energy, and enthusiasm for the good of others and the glory of God. That is a universal call. Whether you are a student or a professional, a work-from-home dad or a stay-at-home mom, you are responsible before God for emphasizing this kind of productivity. So productivity is not about doing more stuff or taking on more projects or crossing more tasks off your to-do list. It’s about doing more good, more of what matters most. Do More Better teaches both why and how you need to do good—good works that benefit others and glorify God. It teaches the great purpose behind our productivity, it tells about common obstacles and how to overcome them, it provides specific guidance on using 3 essential tools for getting things done, it helps you develop daily and weekly routines, and it offers much more besides. The book is short (just over 100 pages), fast-paced, and very practical. I wrote it to be applicable to every Christian, not only the highly-paid businessman or the too-busy-to-breathe pastor. Because productivity is for all of us, I wrote a book for all of us. I hope you’ll consider reading it, and I trust you’ll benefit from it. Do More Better is currently available at Amazon and Cruciform Press.